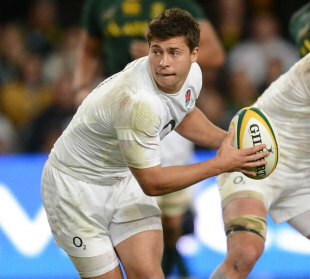 Leicester Tigers boss Richard Cockerill has revealed that England scrum-half Ben Youngs should be fit for the November internationals. Youngs suffered a shoulder injury during England's second Test against South Africa in June and following surgery he was expected to be sidelined until December. But Cockerill believes that the 23-year-old should be back to full fitness in time for England's clash against Fiji at Twickenham on November 10. "Things are going well for Ben and we expect to see him back playing by around the middle of October," Cockerill told the Daily Telegraph. "He'll need some game time then but it's looking good." The newspaper also reported that England duo Tom Croft and Louis Deacon should be back in action within the next month. The news will come as a huge boost for Stuart Lancaster who will have also seen flanker Tom Wood return recently for the Northampton Saints. Saints boss Jim Mallinder has also revealed that England internationals Courtney Lawes should be back on the field in the next couple of weeks.